From a technology perspective, the travel industry has been exceptionally difficult to break into for a long time. It is dominated by the major players, and unless you generate a high volume of business, it can be very difficult to get the access and partnerships needed to be successful. Due to the current dominance of large companies, there hasn’t been much incentive for innovation when it comes to inventory distribution. Small companies want to have efficient systems for tracking and distributing travel inventories, but they don’t have the capital needed for research and development. However, the rise of blockchain could impact this issue in a major way. Read on to learn how blockchain technology is going to impact travel. Right now, hotels, airlines, and rental providers all have centralized databases and allow certain companies access to in order for them to support customers in the booking process. As alluded to earlier, this makes it very difficult for new travel agencies to get access to the information and also hard for new, low-volume travel providers to get agencies to use them. Blockchain technology could significantly change this process with its open-access, decentralized ledger system. At first, companies were afraid of the technology, fearing it would replace them completely. However, many of them have realized that it’s impossible to fight progress and are looking for ways to utilize the blockchain. What does a travel-based blockchain system look like? Quite a few companies are trying to figure that out. The consensus seems to be a token-based transaction network that eliminates many of the fees associated with travel booking. With decentralized storage, there isn’t one database that’s edited by the company that owns it. 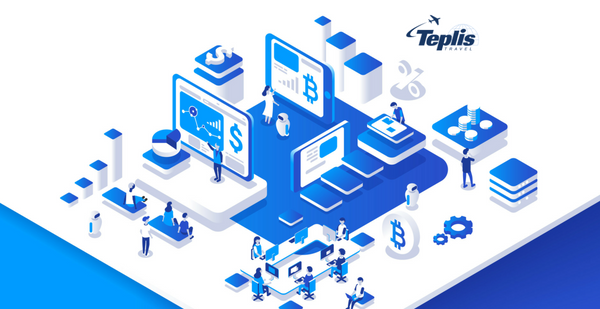 The airline, hotel, or rental provider simply has their inventory on the blockchain, and anyone who understands how to use the technology can use the network to book their needs. Once the transaction is set in motion, the nodes on the blockchain confirm it. From there, the company receives its currency, and the purchaser’s travel booking is complete. The ledger would then be updated across the blockchain, and all users would be aware of the reduced availability in real-time. The only fee that most blockchain developers charge is a posting fee when the transaction happens. This covers the cost of the “miners” that provide the processing power on any blockchain. Many travel agencies fear that this would be the end of their service, but it’s quite the opposite. People can currently book their own travel, but they either don’t have the time or don’t understand technology well enough to get the best deal. The good news is that neither one of these factors will change with this emerging technology. What does change is the amount of fees and negotiations travel agencies will encounter. This streamlined process could greatly increase travel management company’s bottom-line. In addition to agencies’ benefits, tech-forward users will be able to book their own inexpensive travel and without fees. As a corporate travel manager, it’s important to embrace emerging technologies and continue to grow. At Teplis, we can support you during this time of a change. We keep a watchful eye on technology that improve our travel booking process to ensure the best rates for our clientele. For more information on innovative technologies impacting the travel industry or if you need help booking your next trip, contact us today for more information!